One of the gods of Olympus. 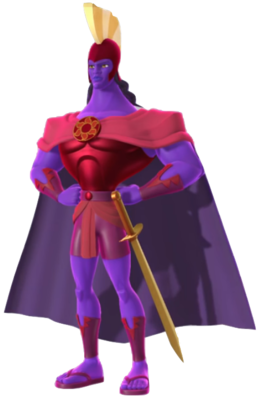 Apollo is a character originally from the Disney film Hercules. He is one of the Olympian gods. Apollo has a very muscular and broad figure with a small waist and a long and thick neck. He has purple skin, golden eyes, and long, dark purple hair. He wears red armor, red gauntlets, red greaves, and red sandals. On his shoulders is a cape that is red on the outside, and purple on the inside. It is attached to him by a crest bearing a sun symbol on it, the sun being the astral body of which he is the deity. He has a golden sword, dangling from his left hip. On his head is a red Hoplite helmet with a golden crest. Apollo is a character in Hercules voiced by Keith David in the original film as well as the animated television series. He is inspired by the god from Greek mythology. This page was last edited on 20 March 2019, at 13:26.